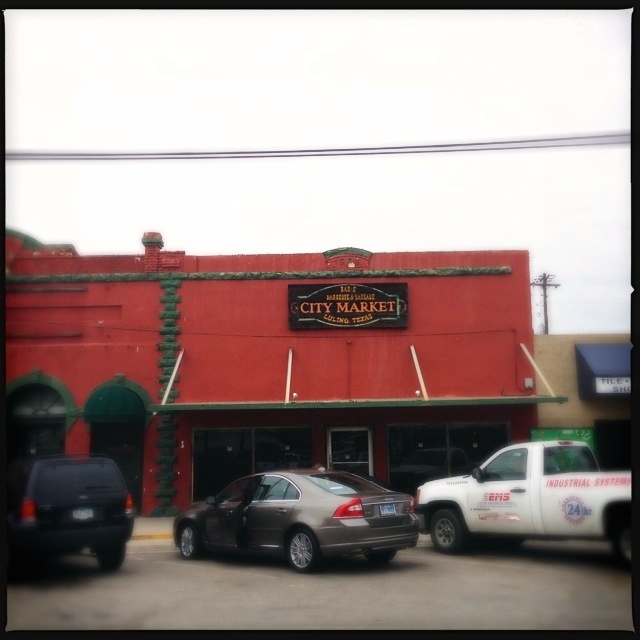 Sitting right in the old downtown of Luling, among the hardware stores and other family business, City Market has tons of character. This place feels like you stepped back in time 50 years. (Which it should, since it was opened in 1958.) It has the look and feel of an old general store, but is full of neat wooden booths and tables. 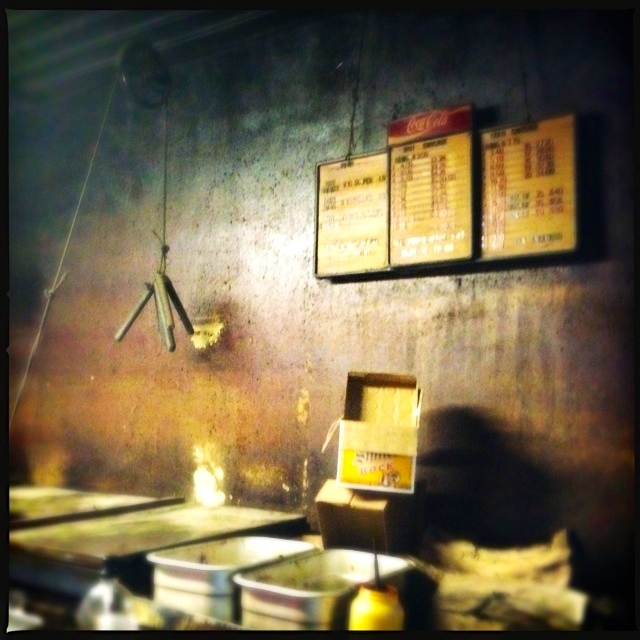 It’s not fancy, and doesn’t feel like a commercial barbecue haven like some of the others. City Market feels like a neighborhood place. Once you step inside, there is a square counter in the center of the room where you get your drinks and sides. You can see a smaller room in back, with two doors marked In and Out. That’s the pit room. Entering the pit room, you can see the long pits along the right hand side and in front of you. The metal topped pits hold the smoking meats until they’re claimed. And they really are smoking; check out the deep smoke in the walls, the lights, and in the air. City Market is serious business. Texas is all about the meat market approach to selling BBQ. You order your meat by the pound or the slice and the boys in the pit room pile it up on red butcher paper (which is, in my humble opinion, the most appropriate vehicle for serving barbecue). No need for plates in this state (unless of course you’re at Black’s Barbecue, where you only get a foam plate). Ask what they have, and get anything they do have. They were out of brisket (which is always a good sign) and wouldn’t have more until 4 pm, so I ordered up the pork ribs and sausage. 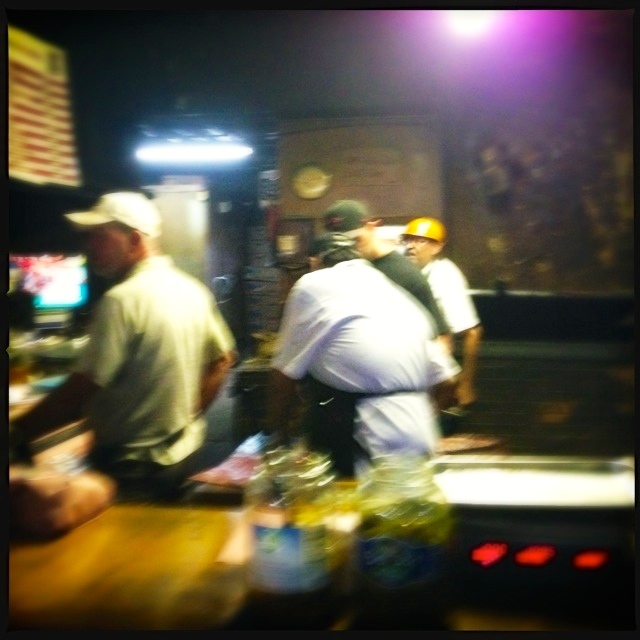 When I was checking out of the smokehouse, the yellow hard-hat clad owner Joe Capello asked me if I wanted pickles. Since the jar was almost empty, I said yes. 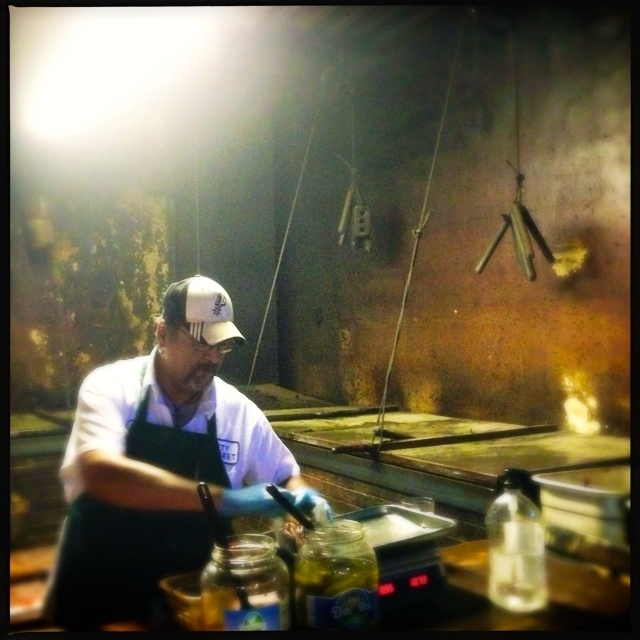 (That is, of course, a great barbecue tour secret. If there are only a few of anything left, that means the locals ahead of you in line almost got away with all of them, so it is a MUST TRY.) These were yellow pickled cauliflower and sweet pickles cut into thick waffles. They were deliciously bright with vinegar and sweet with sugar, and were a perfect counterpoint to the barbecue’s rich fattiness. A genius combination overall. I paid up and took a seat near the pit room doors. 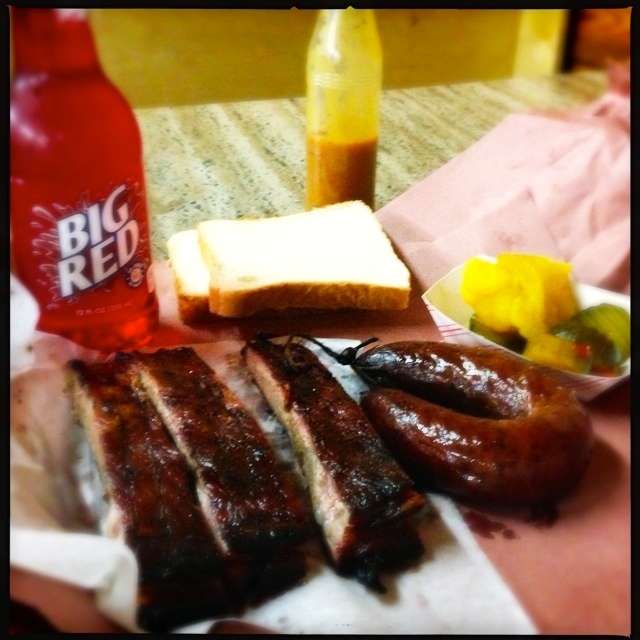 In the end, I had sausage, ribs, beans with pork, some potato salad, and a Big Red soda. You also get onions, jalapeños and white bread. Note that this fine establishment is cash only! 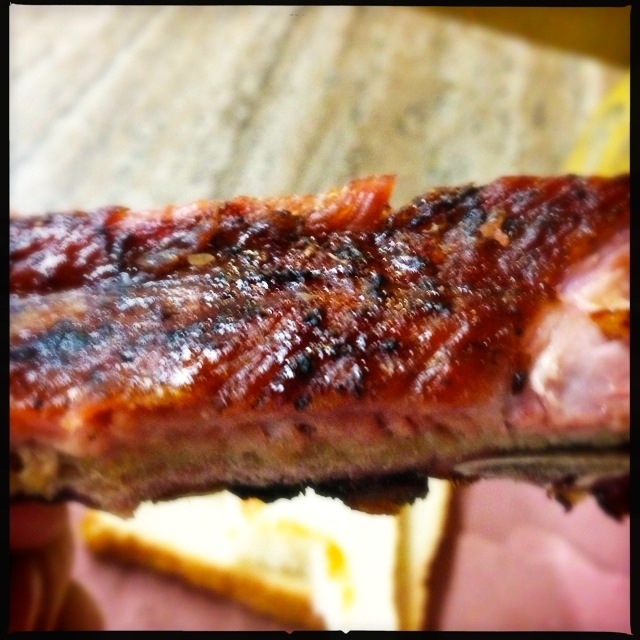 The ribs were excellent, and were a very close second to Smitty’s Market. The differences were minor and could have been due to just the variances a day makes. I found them to be just a shade lesser in the flavor and porkiness department and just a shade less pretty on the overall smoke. But boy, look at those gorgeous babes! Let’s consider sausage. Snap in sausage is important, but it’s the flavor that will win the day. 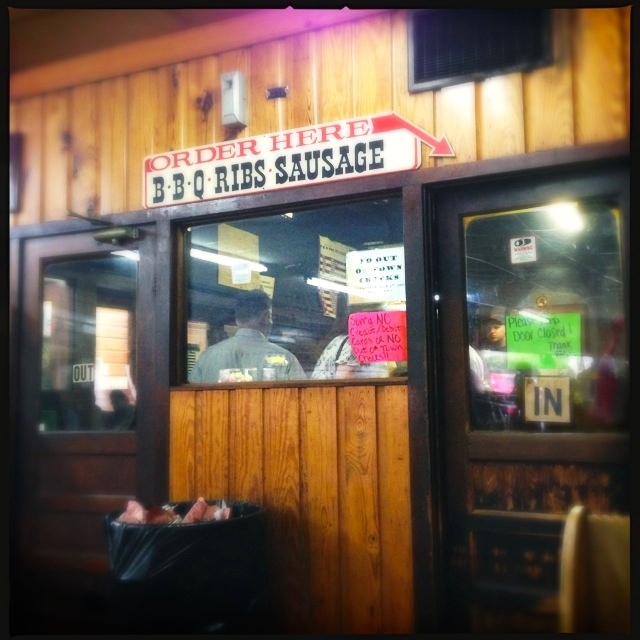 The sausage really stood out here, and clearly and easily beat Black’s Barbecue, Smitty’s Market, and Kreuz Market. Black’s was better than Smitty’s and the both of them were better than Kreuz’s, but City Market blew all three of them away. 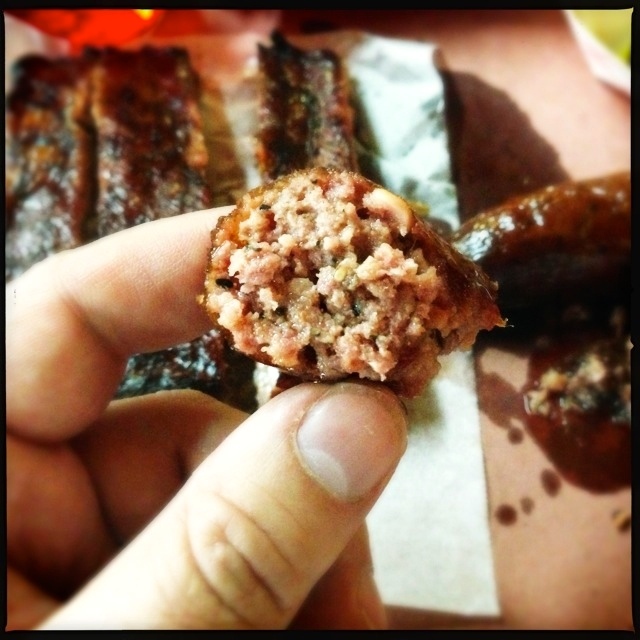 The sausage had a great snap and crunch and was really juicy and flavorful. It had a very nice mix of meat flavor and of spice, and smoked up just perfectly. I should have ordered more. I’ve been seeing this drink everywhere, so I ordered up a Big Red. I don’t know whether it was strawberry flavored or cherry flavored, but it was red. (So I guess it was red flavored?) It was really good with the barbecue, not too sweet, not too tart. A good palate cleanser. I’m a bean man; always have been. City Market’s smoky beans were the best beans of the trip. I ate them quickly, before I could get a picture taken. Such is life. You can’t leave a review of City Market without talking about sauce. (Normally, the only time you need sauce is to dress up the sausage, but this sausage here is fantastic on its own and doesn’t need it.) City Market’s barbecue sauce is unique. Not because it was there. Black’s had barbecue sauce. 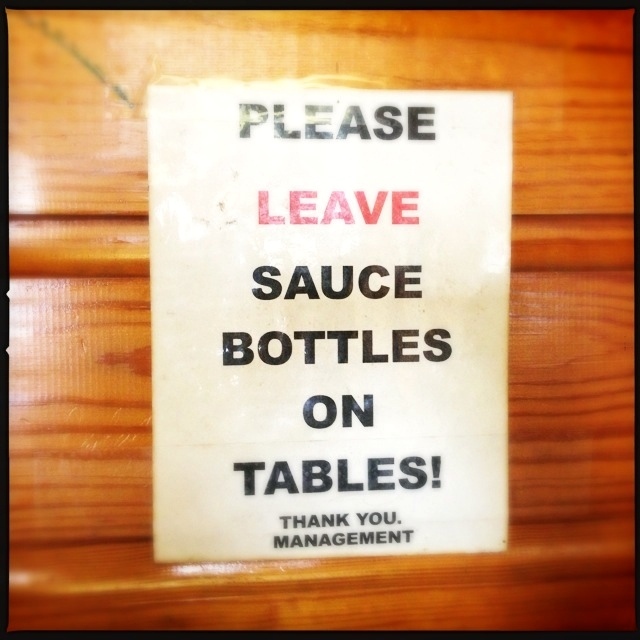 Smitty’s had hot sauce on the tables. City Market’s sauce is unique because it is a mustard sauce. By looks, you start out thinking that this is a honey mustard sauce, but as you taste it you recognize that while there is definitely some sweetness, and also some mustard, it also has some nice heat on the finish. I couldn’t decide if that heat was just from black pepper or also some red pepper powder. It was a really tasty sauce, but in the end, and just like the barbecue at Black’s Barbecue and Smitty’s Market, City Market’s barbecue needs no sauce. City Market is a wonderful place to visit. It’s old school. There are a lot of rules stuck to the glass doors of the pit room. The folks are funny, and maybe a little curmudgeon-y. The barbecue is fantastic. It’s put out in an authentic, old time Texas general store. It’s history in the making, and it’s delicious to boot. I had a great time here, and bet you will too. Don’t miss this on the way to Lockhart. One final tip: City Market does not have forks. If you need one, bring your own.